Well, it seems like I might have one of those fake processors from China, I read about a while ago. I ordered an Intel X9000 for my T601 Frankenpad build, as it was somewhat cheaper as the rest there. It arrived this morning, and I put it in later when I had some time. The computer didn't boot up, didn't display anything on the screen, and was completely unresponsive. The only clue that it was on was the small power on LED under the display. I tried to boot up multiple times, removed the cpu then put it back, nothing changed. I actually started to worry, that my motherboard might had died somehow. But when I put back the original Intel T7300, everything was back to normal. It's very hard to see, but on extremely close inspection I can definitely see a difference. Is this normal? Maybe this print quality variation is normal, I just received a broken cpu, that is otherwise genuine,? Or do you guys think, that it's a re-labeled or completely fake chip? I am about to message the seller for a refund, and will attach these comparing pictures to the message too. 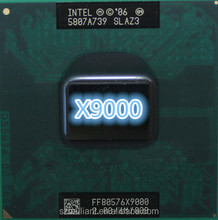 Re: Did I just buy a FAKE Intel X9000 cpu ?! It is difficult to tell, but here is what I suspect about it. I believe that this is a dead processor that has its label re-badged, or printed on again like you mentioned. Other than that, there is one give-away that I have noticed. The AW80576 marking is incorrect, and does not fit in with the time period that it was produced in. It is supposed to be FF80576 like the rest of the processors on the Santa Rosa (800MT/s) platform. The AW80576 marking as far as I know, has only made its appearance on the Montevina (1066MT/s) platform. It should be a dead, but genuine processor that belonged to the Montevina platform for sure. EDIT: The FF80576 marking is only on the Penryn cores that have the full 6MB of L2 cache on-die, my apologies. The same goes for the AW80576 marking, it too only shows on the Penryn cores that has its full 6MB of L2 cache on-die. Have you applied Middleton's BIOS (with the T7300 still in)? If not, the X9000 will not boot! Yes, I have updated the BIOS with Highsun's modded BIOS. I have SATA 2 speed (I checked it in CrystalMark), so I am pretty positive it should work with the CPU, if it wasn't dead, or fake. Just a quick update, I managed to acquire an Intel T9500 cpu, and that works perfectly in the laptop. So it's definitely not a BIOS related issue, something is just not right with that X9000 . Start a "Not as described" case as the X9000 CPU is unfit for purpose as advertised, that is, if it was purchased through ebay. Paypal may help out with a "not as described/unfit for purpose" case and may well help you obtain a refund. I paid with Paypal on Ebay, so I will be protected. At the moment I am just exchanging messages with the seller, he seems to be helpful too. I have an other T61 in pieces, will put it together, and try it in that machine too, just in case. Put at this point I am 99% sure it won't work there either. Strangely enough, the odd ocassion I have had a problem, it has usually been with an ebay seller from China/Hong Kong and not always a fault of the seller, but I have found they will generally go out of their way to resolve the issue properly. It seems to be a matter of business pride to them at least on a person to person, personal level. Rather, it has seemed that way with those I have dealt with anyway. I have never had any problems importing items over the last 18 years either as they seem to know how to label the goods to avoid customs charges. I have losst count of the number of items I have imported from around the world (must be in the 1000's though! ), from places Including China, Hong-Kong, Austria, Australia, Germany, U.S.A, Netherlands, France, Canada, Russia, Poland etc etc. So it's definitely not a BIOS related issue, something is just not right with that X9000 :( . Looks like that X9000 is not an X9000, that's for sure. I checked around for such an X9000 that was labeled with the AW80576 product code, and I did not find anything that matches your X9000. A genuine X9000 would indeed have FF80576 as its product code, just as I had suspected. I don't mean to reveal the eBay seller's name, but is he/she domoki1988 on eBay? Well, that is unfortunate, as even though I will get refunded eventually (hopefully), I have wasted quite a bit of time already trying to get it to work. And time is something I never have enough anyway. No, the seller is not the mentioned one. A quick google just pulled up the following from a search criteria of "AW80576 cpu"
Also I find it suspect that the upper panel labelling does not match with the lower panel labelling. Top panel refers to one processor type (Core 2 Extreme), the lower panel refers to Core 2 duo, if the X9000 reference is omitted from the end of the number. Searching AW80576x9000 results with no results from search. Further, it does appear as if the panels have been re-Tampo printed hence the rougher texture. My nightmare continues. I have managed to get my hands on two T9900 cpus, both from Ebay from China. One of them is perfect, I write about my experiences in the T60 thread, doing some impressive undervolting on it. But the second one... well, it's a confirmed fake chip. I already had a bad feeling upon close inspectiont, when I saw that rough printing texture, that I observed on my previously mentioned X9000 processor (that wasn't working at all, and had to send it back). As you can see it is an Intel E8135 processor. Needless to say I am about to write to the seller and ask for an refund. Alsi want to mention that these two fake processors that I talk about in this thread are from two separate sellers. The first one was a newly started seller, and he sounds very helpful, so I think he got scammed too (but will see his real intentions when he gets back the chip and will me indeed refund me or not). But this second seller has thousands of feedbacks, above 99% are positive. So it's hard to believe that he intentionally scammed me. Will see his reaction when I write about this to him. So I would say that fake processors from China are indeed a possibility, not just a myth. Everyone be very careful, and ALWAYS test the processors as soon as you can, otherwise if you wait for weeks or months, then you will be out of luck, as eBay can't help you any more. Jesus, I didn't expect another re-labeled processor coming from China. I hope you will get the refund for both of these re-labeled processors. One thing though, that re-labeled Core 2 Duo E8135 is not a real Core 2 Duo E8135. It is actually a rare PGA478 engineering sample of the Core 2 Duo SP9400 as CPU-Z has correctly detected it. A real Core 2 Duo E8135 would be clocked at 2.66GHz, not 2.4GHz, which was what the re-labeled E8135's BIOS name had stated. If I am not wrong, the Q-Spec of this strange engineering sample is QZNM. It was also one of the known PGA478 variants of the BGA956-only Core 2 Duo SP9400, and that is a 25W TDP processor. Before you do let go of this rather rare processor, could you post the CPUID data of it to CPUWorld via its CWID program? It would be very helpful to know the features of this engineering sample. Thanks. Oh I forgot to mention that I got this cpu working in a T61 motherboard with BSEL pin mod. So it's running on 800 mhz fsb, not 1066 as it was designed for. That's why it's frequency is 1.8 ghz max, but I see thqt you already figured that out. I didn't even notice that in CPU-Z, just now that you have pointed it out. To be honest I was fuming as I couldn't believe my bad luck again, and didn't pay much attention. I will check it out more thoroughly when I have time, probably on Wednesday. Your knowledge of things never fails to surprise me. I was reading through this thread as it stands so far, and I would have never imagined this twist in the 'story'. Is it a thing (for you? in general?) to know specs of Intel Engineering Sample chips? Is it like a type of hobby? No, not really. I believe that with patience, anyone could easily find out the Q-Specs by downloading the appropriate specification update sheet. Although, most of my knowledge comes from actually receiving them from a shady seller, and some from the specification update sheets. Probably not, I never thought of it as a hobby. From my experience its a matter of giving you good service so you'll develop a brand loyalty of sorts with them. I haven't really been online here recently, as I am crazy busy with a project I am working on. but I thought I will give a quick update. I wanted to test out that fake X9000 cpu that is an engineering sample as was discussed, but the laptop in which it is located is unable to go online, and I just don't have the time do allocate a few hours for that project. Maybe in the future. The good news is, that I have been refunded by both sellers, so I haven't suffered financial loss. Of course all the frustration, and wasted time was still a huge negative of this whole ordeal. Funny thing is, I still use my T60 as my main machine, I just sort of have my T601 Frankie built up in reserve, if something happens to my T60 in the future (it's a 12 year old machine now after all, and not even Thinkpads last forever). Fake listings on the Lenovo outlet?